At Heartland Foam InSEALators, we like to emphasize that we don’t just insulate, we InSEALate. While some might think we’ve forgotten how to spell, we feel it’s important to stress the most important factor that makes Spray Foam such a superior insulation method. It SEALS! 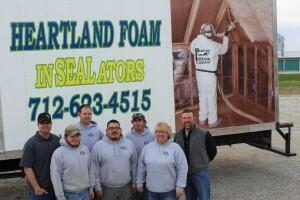 Heartland Foam InSEALators was established in January, 2008 by Scott Allensworth. Located in the beautiful city of Red Oak, Iowa, Heartland Foam InSEALators has been servicing Southwest Iowa, Southeast Nebraska and Northwest Missouri for over 8 years. We are committed to providing affordable, healthy and energy efficient solutions that are environmentally friendly, permanent and American made. We are experts in this field, and have extensive training and experience in designing solutions for residential (new and old), commercial, agricultural and steel frame projects. We don’t just insulate homes, business’s and barns though. We’ve insulated everything from chicken coops, hunting blinds to walk-in freezers. Spray foam is an extremely versatile product that sticks to most any surface allowing us such flexibility in what we can insulate. Let us help you stay InSEALated.